Here you will find my full curriculum vitae and some of my accomplishments. You can also view the latest information I regularly post on this site. 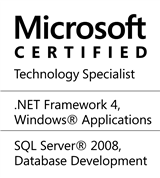 The Support section contains various useful informations for IT development or technologies. Feel free to contact me if you have other questions. Website to manage a football club, including a pronostics game.